A weekly guide to action. The times may be dark, but they’re not hopeless. We have the power to join together and fight back. Now more than ever, we need to shore up our bonds of community, activate our networks, and make our voices heard. To this end, Blunderbuss is compiling a weekly roundup of events in our hometown of New York City that offer a chance to push back against the rising tide of hate and authoritarianism. Don’t expect this list to be exhaustive – this city is too full of energy and activism for us to stay on top of everything. But if you’ve got an event you’d like to see listed, feel free to hit up Travis at tmushett@gmail.com. All descriptions are authored by event organizers and occasionally trimmed for length. Times and locations are subject to change, so please click through the links to confirm. Join The New York Immigration Coalition and Majlis Al Shura: The Islamic Leadership Council of Greater NY in showing solidarity with the Muslim and refugee community in response to President’s Trump’s Executive Order. Since last week, individuals from 7 Muslim countries have been detained at JFK, removed from airplanes coming to the United States, and have had their visas cancelled. The NYIC is committed to fighting for a complete reversal of the Executive Order and protecting members of the Muslim community. Last Friday’s Jummah Prayer was a powerful demonstration of solidarity with New York’s Muslim and immigrant communities. This Friday, we will conduct one at JFK International Airport, where people have been detained, held, and questioned. Imam Al-Hajj Talib ‘Abdur-Rashid of the Mosque of Islamic Brotherhood will lead the prayer and deliver the Khutba. Please join us on the front steps of Hammer for a show of solidarity in support of our Muslim, immigrant, and refugee community members. Co-sponsored by the CUMC Muslim Student Organization, Dígame Más, HRI/Asylum Clinic, and White Coats 4 Black Lives. The Astoria community stands together with Muslim-Americans. Muslim-Americans and Muslim immigrants are a core part of Astoria’s history and community. Our nation was founded by immigrants and immigration continues to be an integral part of achieving the American Dream. President Trump has put anti-Muslim bigotry into law – and we must fight back. We need more senators to speak out, and many haven’t. Every day they are silent, Trump’s Muslim ban gets harder to defeat. That’s why we are calling on Amnesty activists like you to send a loud and clear message to your senators: Trump’s Muslim Ban Is shameful. Our leaders must reject it. On Monday, leaders from the NYC Tech Community united to sign this letter (https://www.technyc.org/trumpeo) to President Trump setting forth the reasons that we oppose his executive order banning immigrants from certain countries and refugees. As New Yorkers and members of the city’s growing technology sector, we view the order as a direct threat to the diversity and inclusivity that fuel our city and are critical to the continued success of our industry. Let’s keep the momentum going and put some faces to the names on the letter. Meet at the northwest corner of Union Square at 5:30 pm this Friday to let the President know that we in tech reject the ban! Join us for the first happy hour of our new Bronx/Uptown DSA Branch! Nothing wrong with trying to capture some joy, some solidarity and hope. Oh and booze. A strategy session with community leaders, elected officials, and other professionals on the needs and potential solutions to the violence affecting the Trans and Gender Non-Conforming community in New York City. The discussion will focus on education, immigration, employment, policing, housing and healthcare, and will be led by Trans and Gender Non-Conforming leaders. Stories and poems and comics — projected on screen for live reading! — by MUTHA Magazine contributors, all about keeping it real with kids and keeping every person’s reproductive rights safe in this terrible %^&* time in our country. All proceeds go to Planned Parenthood NYC Action Fund! Combining grassroots community engagement with municipal boycotts, community actions, testimony, and education campaigns, the tour–No Child Behind Bars: Living Resistance From the US to Palestine–explores state violence, particularly the criminalization and detention of youth in Palestine and the US. The tour focuses on the interests and powers that reinforce these systems, with the goal of destabilizing them and breaking them down. Ahed Tamimi is 16 years old, charismatic, and articulate. She will be speaking from her home in Nabi Saleh, Occupied West Bank. Amanda Weatherspoon is a Unitarian Universalist minister and Black liberation activist in the Bay Area. Her ministry is centered on collective liberation with an intersectional approach. Nadya Tannous is a writer and organizer in the Bay Area. She has researched the detention of Palestinian minors since 2013. Which Way Forward? : Meet the Organizers Behind the Inaugural Protest! After millions inaugurate the resistance against Trump, which way forward for the movement in the U.S.? Join a public forum hosted by the Party for Socialism and Liberation in a panel and discussion on the recent January 20th inaugural protest. Across the country, people are asking the question, where do we go from here? Join us as we look to what the future of the resistance movement will be against racism, sexism, xenophobia, LGBTQ bigotry, and all that Trump and his administration represents. This event will be a panel discussion with the organizers of the inaugural protest and we will engage in political and practical discussion about the future of the movement in the U.S.
Twice, the people went into the streets. Twice, the police drove them away. What began as protests became uprisings. In the once-prosperous industrial city of Maribor, Slovenia, anger over political corruption became unruly revolt. This participatory documentary places audiences in the midst of the third and largest uprising as crowds surround and ransack City Hall under a hailstorm of tear gas canisters. Soon the mayor will resign—and the movement will spread to cities across the country. The Maribor Uprisings takes up urgent questions raised by these events, and by uprisings elsewhere, from the Arab Spring, through Paris, to Black Lives Matter. What sparks such popular outrage? How are participants swept up in—and then changed by—confrontations with police? Could something like this happen in your city? The directors Maple Razsa + Milton Guillen invite audiences to engage these questions through an unusual and participatory form. Drawing on the dramatic frontline footage of a video activist collective embedded within the uprisings, this film places viewers amidst the jostling crowds. It requires them to make their own choices about which cameras they will follow and therefore how they will participate. Like those who joined the actual uprisings, audiences in the theater must decide whether to listen to organizers and remain with those committed to nonviolent protest on Freedom Square or to follow rowdy crowds toward City Hall and almost certain conflict. Both Maple Razsa and Milton Guillen will be in attendance for discussion following the program. Every dollar given goes directly to LGBTQI/ HIV+ folks currently facing the immigrant carceral system or those currently incarcerated in immigration prisons across the nation. Show- up, dance & support! Here in NYC, it is being organized by a group called “Pro-life Future NYC” and they will be protesting at the Planned Parenthood – Margaret Sanger Center at 26 Bleecker Street. We cannot let them go unopposed! We are organizing a meeting to plan a response and counter-rally that can beat them back and show that NYC stands for full reproductive rights and access for all women. Planned Parenthood in NYC has called for other forms of support rather than directly confronting the right-wing protestors. While we stand with Planned Parenthood and are grateful for the amazing work they do, we also recognize that this fight is bigger than just one organization – reproductive rights for all women are at stake right now. So we organized this meeting as a place for people to come together and discuss how we can best respond to this renewed assault on our rights. We are coalition of groups and individuals organizing for an Elected Civilian Review Board (ECRB) – a grassroots body that would be empowered to discipline the NYPD and work with an independent Special Prosecutor to bring justice to victims of police violence. Join the NYC Campaign for an Elected Civilian Review Board! Come out to the next organizing meeting to learn more and contribute your ideas. We work together democratically and consciously build the participation and leadership of those most affected by police violence. Join us in front of the Stonewall Inn as we stand in solidarity with every immigrant, asylum seeker, refugee and every person impacted by Donald Trump’s illegal, immoral, unconstitutional and un-American executive orders. We will also speak out against Trump’s selection of the most anti-LGBT nominees and appointees in modern history. Welcoming refugees and immigrants not only makes our country great, but is also a religious priority. Come and join people of all faiths from our neighborhood as we share music and hear stories from immigrants and refugees, as we celebrate the story of the wretched refuse of the world making America great. Join us outside BAM’s Howard Gilman Opera House as we tell Batsheva their range of motion cannot hide their support for apartheid! With music from the Rude Mechanical Orchestra and a special performance by NYC’s own Freedom Dabka Group, we’ll celebrate art for liberation – not occupation. Batsheva director Ohad Naharin says that he believes in social justice and supports Palestinian rights, but he also calls boycotts and protests pointless, and doesn’t acknowledge his dance company’s role in the government’s Brand Israel campaign, which uses the arts to whitewash the structural realities of apartheid and occupation. Like Brian Eno, who recently denied Batsheva the use of his music for its Israeli embassy-sponsored performances in Italy, we cannot accept this whitewashing. If Naharin really stands against the occupation, we invite him to show us by dismantling Batsheva’s complicity with it. President Cheeto and Prime Minister Bibi are meeting up for the first time on February 15th. The former has just issued a Muslim ban and a Christians-only policy for refugees. The latter has closed Israel’s borders and called for 5000 new settlements on Palestinian land. We will not be silent in the face of the racist right. No matter what flag they fly. From JFK to East Jerusalem, we will #shutitdown. Come out this Sunday to meet your fellow MuJew antifascists and help us plan a mass demonstration in NYC for F15! We will also be discussing other actions we can take to build a united front against fascism. Allies welcome. Let’s raise our voices together and make some music in the streets! Join us for #ThisIsWhatDemocracySoundsLike, a community sing-a-long for freedom under the Washington Square Arch on Sunday, February 5th. ALL ARE WELCOME to listen or join in. We are partnering up with New York City’s community of musicians and together we will make a JOYFUL NOISE. Bring children, instruments, pennies, checkbooks and voices. Friends and community members, please join us for our next SASI meeting. As we head into the new year this will be a perfect opportunity to get involved with SASI and the issues that we will be working on in the coming months. As always our events are free and open to the public. The extraordinary outpouring of resistance against Donald Trump is a sign of great hope, but it will take more than protest, lawsuits, or even a general strike to defeat him. Join independent journalist Arun Gupta as he discusses his reporting from around the United States to explain why Trump came to power and how only genuine organizing and base-building can thwart his extremist agenda. Based on conversations with more than 100 Trump supporters, Gupta will explain why many unionized workers flocked to Trump, how they can be won back to progressive politics, the role of trauma in liberal political reaction, how Trump used libidinal politics to craft a winning narrative, what the left gets right and where it has gone wrong. This will be followed by a discussion with the audience as to how to build real counter-power in New York and how that relates to protests, mobilizing, and electoral politics. Queens is organizing & strategizing – come through! Please join us for the next full-group #GetOrganizedBK meetings at Congregation Beth Elohim (at 8th Avenue and Garfield Place, in Park Slope). We’ll try a little different format. We’ll start at 6:30, with a panel/program. Then at 7:30, we’ll break down into working groups to keep organizing and planning. Feel free to come for either part (or both, of course). As NYC students we must rise up against bigotry, hatred, and prejudice. We are a part of this city. We are Muslim. We are immigrants. And we have a voice. As students from different schools and instiutions we plan to walkout of school at 12:00 pm on Tuesday in protest of the tragic executive order that WILL affect us! We will not remain silent. We will not repeat the failures of our past. Come to SRLP’s Movement Building Team meeting to write cards and letters to our Prisoner Advisory Committee members who are currently incarcerated. Join us in fighting the isolation of our communities! Resist Trump Tuesdays: Beat Back the Banks! EDITED: Given the recent comments from Donald Trump on rolling back Dodd-Frank and his recent Finanical Executive Order written by former Goldman employee Gary Cohn we have decided to change our target and message for this Tuesday’s action. Please spread the word that the location has changed! Last week President Donald Trump announced he was rolling back #DoddFrank and bringing on Jamie Dimon, CEO of J.P Morgan Chase as an advisor to that rollback. Trump’s exact quote was, “We expect to be cutting a lot out of Dodd-Frank because, frankly, I have so many people, friends of mine, who have nice businesses who can’t borrow money. They just can’t get any money because the banks just won’t let them borrow, because of the rules and regulations in Dodd-Frank,” As we all know Dodd-Frank was put in place because of what happened in the 2008 economic crisis. Additionally this Tuesday Steve Mnunchin, former employee of Goldman Sachs will be up for a Senate floor vote for Secretary Treasurer. Trump campaigned on beating back the Banks in D.C. so let’s show him what that really looks like. As a part of our next #ResistTrumpTuesdays, we’ret taking it to the banks and meeting infront of Chase Bank and marching to Goldman Sachs. 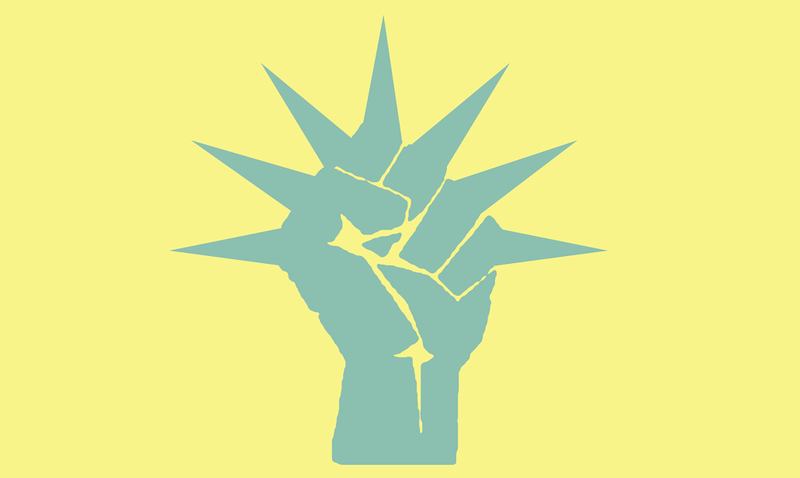 We’re in the beginning stages of developing a flat, all volunteer group united in anger, organized into working groups, and committed to direct action. We’re focusing on everything from policy and data analysis to organizing protests to ensure that we have the largest impact possible. We need people with all skills and interests. Whether you are an artist or a software developer or just somebody who wants to get involved, everybody’s contribution is valuable. An agenda will be sent out via email ahead of time. If you are not yet on our email list you can sign up using this form: tinyurl.com/TrumpTownHallEmail. Drinking Liberally is back on February 7th at Fourth Ave Pub and we will be joined by Indivisible Nation BK. We will begin as always at 7pm, with happy hour until 8pm. Indivisible Nation BK is a Brooklyn-based group of concerned citizens working together block and speak out against extremism in the Trump Administration and White House. They share information about Trump’s proposed appointees and offer actions you can take to protest the nomination of individuals who would undermine and dismantle the institutions that support all Americans. They plan on bringing letters to congressmen and Senators Schumer and Gillibrand that we can sign and they will deliver to their offices. We really hope you can join us for this special DL. New York City Councilmember Jumaane D. Williams, New York State Senator Kevin S. Parker, New York State Assemblymember Rodneyse Bichotte, and District Leader Josue Pierre will host “State of Immigration: State of Emergency.” At this immigration forum, attendees will learn about immigration policy changes under President Trump and how to prepare for them. A panel discussion will take place, and representatives from city agencies and local organizations will answer questions about immigrant rights and the changes to our country’s immigration policies. Announcing this amazing talent to perform our benefit! PLANNED PARENTHOOD NYC VOTES (PPNYC VOTES)! Join us for the February Social Justice Communicators Meet-Up! The meet-up happens monthly, and we’ll be holding the next one on Wednesday, February 8 at 6:30pm. This time, we’ll meet at MADRE’s office, 121 West 27th Street #302, so that we can talk in a quieter space. It’ll be a BYOB event, and afterwards, we can round off the evening at a local bar. We know folks are eager to to keep this conversation going throughout the month. If you’re interested, you can join our new Google Group here: http://socialjusticecomms.tumblr.com/join We’re hoping the listserv will allow us to share resources, stay in touch, and find opportunities for collaboration beyond our monthly get togethers. The Revolution will include adult beverages! Join the Queens Branch of Democratic Socialists of America for an evening of comradeship, cocktails, and a juke box too. So how do we start having conversations with our friends, family members, coworkers, coreligionists, workout buddies, and team members? What kinds of conversations lead to greater engagement from the sympathetic uninvolved — and can even break down barriers with people hesitant to support our cause? Join the Sierra Club Beyond Coal Campaign and the Sane Energy Project for a workshop on the basic building block of organizing: the 1-on-1 conversation. This highly participatory workshop will help you reach new people and kick-start the movement we need. Although it will focus on climate change/renewable energy, the basic skills will apply to many different causes. A. Marshaling is a form of resistance. Marshals help build community by supporting Rise & Resist actions. As marshals, we know the scenario for an action because we’ve been involved in the action’s planning, and we work together to support protesters do what they need to do while keeping the action as safe as possible. We don’t ask for permission to demonstrate, we don’t ask for the NYPD to “help” us demonstrate. We protect our First Amendment rights to free speech and freedom of assembly by using these rights. We set up our own pickets, we decide whether or not we want to go into a “pen”, we ourselves stop traffic for our marches. We communicate with demonstrators, and we provide a buffer between our group and the NYPD or hecklers. We de-escalate conflicts between protestors, counter-protestors, and the NYPD. If you’re an experienced demonstrator or new to protesting, we encourage you to come and get trained. Marshaling is a great skill to have and a most excellent way to participate in actions.